Image courtesy of Library of Congress During the Senate trial of impeached President Andrew Johnson, his son-in-law, Senator David Patterson of Tennessee, voted to aquit the President. On this date, the House voted 126 to 47 to impeach President Andrew Johnson, the culmination of a showdown between Johnson and Radical Republicans in the 40th Congress (1867–1869). The President’s leniency towards the former Confederate states threatened the Radicals’ more drastic southern policy seeking immediate citizenship and enfranchisement, as well as social and economic aid for freed slaves. As a result, Johnson regularly vetoed congressional Reconstruction legislation and Congress overrode his vetoes more than any other President. After failed attempts to introduce articles of impeachment against Johnson, and in an effort to protect like-minded members of his Cabinet, Congress passed the Tenure of Office Act in March 1867. The legislation barred the President from removing Cabinet officials appointed during his term in office without the Senate’s consent. Yet Johnson, bent on challenging congressional Republicans, twice fired Secretary of War Edwin Stanton, who often worked closely with congressional Radicals: once in August 1867, when a congressional recess meant the Senate could not immediately concur, and again in February 1868, after the Senate eventually refused its consent. Witnessing what it believed were “high crimes and misdemeanors” on the part of the President, the House adopted 11 articles of impeachment, eight of which dealt with Johnson’s alleged violation of the Tenure of Office Act. “All of the circumstances attendent [sic] upon this case show that the President’s action was deliberate and willful,” intoned Judiciary Committee Chairman James Wilson of Iowa. “Perversely he has rushed upon his own destruction.” Seven House impeachment managers—led by Representative Thaddeus Stevens of Pennsylvania, the de facto Republican floor leader in the House—tried Johnson’s case for two months. 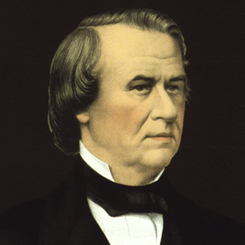 On May 16, 1868, the Senate failed to convict Johnson on Article 11, falling short of the necessary two-thirds majority, by a single vote, 35 to 19. Ten days later it failed to convict the President on Articles 2 and 3 by the same margin, after which Senators voted to adjourn the trial.